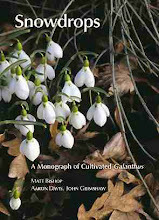 The list of Colesbourne snowdrops available in 2011 was posted on the sales page of our website last night. Please note that we do not supply by mail order, but we accept reservations for collection in snowdrop season. The December issue of The Plantsman arrived this morning. As usual its pages contain a diversity of fascinating articles, including a discussion of the Chinese botanical drawings collected by John Reeves that I wrote about last year that is of particular interest to anyone interested in the history of plant introductions or botanical art. 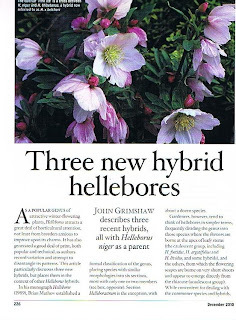 My contribution to the issue is an article about hybrid hellebores, reviewing the history of hybridity in the genus and focusing on the role of H. niger as an important maternal parent. In it I formally described three crosses for the first time, establishing a scientific name for each that will cover all progeny from these parents wherever and whenever they may occur again. There is a history in Helleborus of naming hybrids to commemorate their breeders or those associated with them: H. × sternii, H. × ballardiae and H. × eric-smithii are familiar, H. × lemmonierae less so; the epithets for these new hybrids continue the tradition. Two have been around for several years, one is so far almost entirely unknown. H. × belcheri is the new name for the hybrid between H. niger and H. thibetanus, best known under the cultivar name 'Pink Ice', raised by Ashwood Nurseries and first exhibited in 2001. 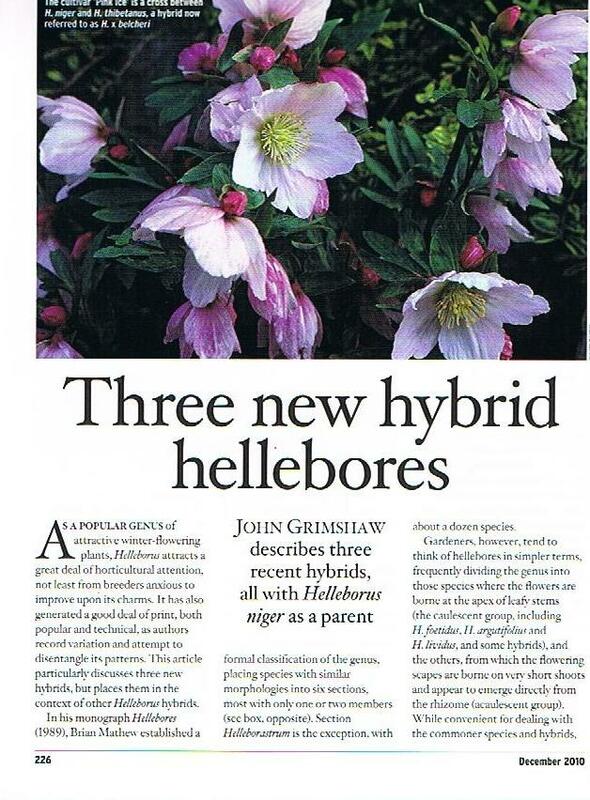 It commemorates Kevin Belcher, hellebore breeder at Ashwood, who has done so much to develop hybrids in the genus, and who was the first person to make this cross. Its pale pink flowers are very pretty. The same nursery is commemorated in H. × ashwoodensis in recognition of the development of the genus there. This is the plant first exhibited in 2002 as 'Briar Rose', H. niger and H. vesicarius, the oddity from Turkey that goes dormant in summer. The resulting plant is rather remarkable, not really resembling either parent, but extremely decorative when well grown. Both of these have been available for several years from Ashwood. The third, H. × sahinii, is the very unexpected hybrid between H. niger and H. foetidus, raised by my former colleagues at K. Sahin, Zaden B.V. in The Netherlands from a cross made in 2004. It is named in commemoration of the late Kees Sahin, founder of the company, who had a great love of anything unusual or somewhat bizarre, and this plant seems to fit that description. Its pale, greenish-white flowers are not unattractive, and are frely produced on larger plants, but it has the habit of flowering at odd times; this photo was taken in the cottage garden here in August. It will be sold under the cultivar name 'Winterbells' when released to the market in the near future. It's a year today since I started this Garden Diary, with a picture of a coconut palm-fringed tropical beach. The best I can do today in the way of palms is this Trachycarpus wagnerianus, iced with a flurry of snow that fell a little earlier this morning. Writing the Diary is a lot of fun and has brought me into contact with a lot of interesting people, whether in person or in cyberspace, and I'd like to take this opportunity to thank all my followers and viewers for their interest. It's amazing to see where you all are and where in the world my posts are being read. Your comments and feedback are always welcome and I hope you'll continue to enjoy my posts. Mahonia x media 'Winter Sun'﻿ was catching the rays of its namesake this morning when I went to put the bin out, and looking lovely despite the fact that the thermometer read -4.5C. Many of the buds have already been destroyed by frost, so the display may not last very long this year. With permafrost setting in on the Cotswolds I am glad that the last bulbs - fifteen hundred or so snowdrops - were safely planted earlier this week. Having been stored in a cool shed over the summer since lifting in June they are in good condition, though most were pushing out a shoot and developing short roots. 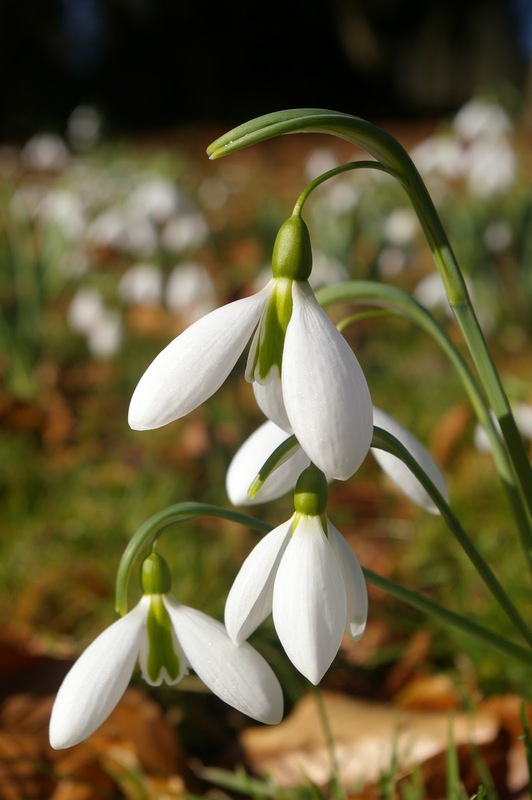 One would not recommend keeping snowdrops out of the ground until late November, but as with use-by dates, horticultural practice and recommendations do not always have to coincide. When planting bulbs I often wonder just how quickly they sense that they are back in the ground. My knowledge of plant physiology is relatively limited, but it is obvious that if a root tip comes into contact with moisture, electroconnectivity will be established almost immediately, enabling the plant to respond in the appropriate fashion as its physiological processes mobilize to react to the stimuli received. Browsing the gardening blogs recently I came across this video (see link below), posted on Lost in the Landscape. It has some very thought-provoking insights into the place of plants in the philosophical world order, and explores sensibilities in plants, especially in the root tips, through their neurobiology to theoretical applications in technology. Professor Stefano Marcuso speaks English in a charmingly Italian fashion, so the subtitles may be found useful. This Pheasant (Phasianus colchicus) has been frequenting the grounds of Colesbourne Park for the past couple of months and has become increasingly bold, chasing vehicles and people. Not many pheasants can be called 'a character' but this one certainly is. He has developed a particular antagonism to our workhorse Fergie tractor, being driven here by our gardener Will Fletcher, and sets off to chase it as soon as it comes into view, sometimes following it for several hundred metres. This was his performance this afternoon, edited as best I can into a passable sequence, minus the lengthy shots of fallen leaves. Iris foetidissima is the sort of plant that I can't imagine fashionable garden designers ever even thinking about, though I hope I'm wrong on that. In a genus noted for its flowers its floral display is dowdy, with rather inconspicuous pale greyish-blue or pale yellow flowers in June or July, and the leaves do live up to its unencouraging specific epithet when rubbed or damaged. On the other hand it has some excellent qualities, notably its tolerance of dry shade - very dry, very shady shade; evergreen foliage (with a handsome variegated form 'Variegata' and another with golden leaves 'Aurea', though I don't feel an urge to grow that one); and, above all, its fruits in winter. The flowers quickly give rise to rapidly swelling green capsules that usually become pendulous with the weight of seeds within, and as autumn progresses into winter split along their corners to reveal rows of bright orange seeds that shine in the low sunshine (as those illustrated above were doing today). These can persist for several months through the winter, making a really useful contribution of colour and interest to the garden. It was notable, however, how quickly they were taken by birds in the severe weather last winter, demonstrating what must be the evolutionary reason for the bright berries - dispersal by birds. Although the normal bright orange-fruited forms are most commonly seen, two other colours are available. The so-called yellow-seeded form (it has never had any formal name) has paler orange seeds that are also attractive and conspicuous (right) and nice to see, but it is not a substitute for the typical bright orange. Interestingly, there seems to be no correlation between fruit colour and flower colour: the flowers of this (as grown here) are typical grey-blue, while the yellow-flowered 'Picos Yellow' has bright orange seeds. An excitement for me this autumn was the first fruiting of the white-seeded form 'FructuAlbo', whose pods started to open in October to reveal the pure white seeds inside. 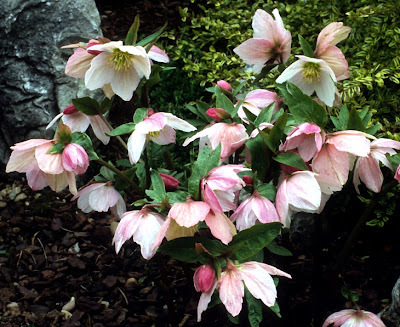 They were very striking against the dark leaves in a shady spot - the past tense is used deliberately, as I've given away some, and have sown the rest as I didn't want to feed the birds with them and think I can use a mass planting of it somewhere. The history of 'FructuAlbo' history is interesting: it not mentioned by any of the usual sources of information on curious variants, and in the first edition of Brian Mathew's book The Iris (1981) he says that he had not seen either the white- or yellow-seeded variants. He recounts that 'FructuAlbo ' was first found in 1921 by one Mary Ellen Shedden of Bridgewater, Somerset, in a hedgerow amongst normally coloured plants. 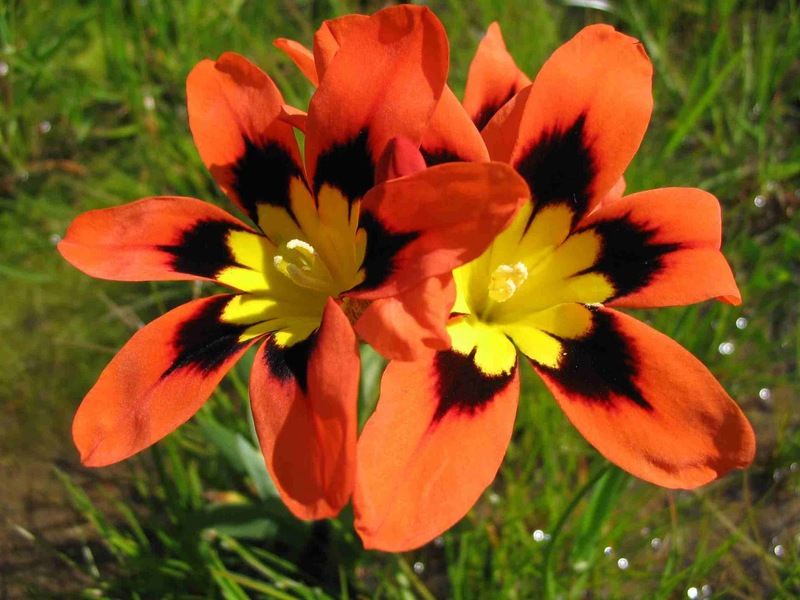 By the next edition in 1989, however, he was able to report that the Iris species enthusiast Anne Blanco-White had managed to find material and introduce it to a wider audience. I have always known the plant by its vernacular name Gladdon, derived from the Old English glaedene, and ultimately, like Gladiolus, from the Latin gladius, a sword, in reference to the leaf shape. With this history in the name it is unfortunate, therefore, that the standardised English name, is the rather boring, though not new, Stinking Iris. This amazing video is by Marco van Noort, Dutch nurseryman and plant breeder, whose website can be found here (if you can't cope with Dutch the option to translate it into English is in the top right corner of the page, though the content is not quite the same). Thanks to Marco for allowing me to post it here. The developments in Echinacea over the past ten years or so have been astonishing, including the emergence of doubles in E. purpurea, the first of the coloured hybrids, and now the combinations of characters seen here. Despite the example seen in Marco's video, of fine clumps thriving in the open ground, it is unfortunate that one very seldom sees established thriving clumps of any of the hybrids in gardens, despite huge numbers being sold annually. It seems that they are very easy for nurserymen to grow in pots but that they then fail to establish properly in the ground, and do not reappear next spring. I have heard suggestions that this is because nursery stock is grown in peat-based composts, or that the plants are not vigorous enough and exhaust themselves with their first few flowers. Matt Bishop at the Garden House in Devon, reports that he has had some success by planting plugs and cutting off the flowers until the plant has become properly established - this seems a very sensible course of action. It is possible, however, that continued selection of second or later generation hybrids will yield selections that have more of the desirable longevity of E. purpurea and less of the short-lived E. paradoxa in their constitution - one certainly hopes so. We urgently need a full trial of new Echinacea selections - it's not very long ago that the RHS trialled E. purpurea at Wisley, and very dull they seem in retrospect - not only for their colours or floral shapes, but for growability and perenniality under a range of different conditions, and with research into the best methods to produce what will be a long-lived reliable plant for the gardener. Seed mixtures of Echinacea hybrids are now available from seed companies, and I'm inclined to try these next year to see if home-grown seedlings establish better than pot-grown specimens, and also to try to recreate the vibrant mass of colour captured in Marco's video. Chrysanthemum 'Sarabor Lilac' is one of the cultivars we grow in the polytunnel for late-season cut flowers: they are cursed for much of year for the amount of water they need, but their flowers are very welcome now. I'm not sure about the colour, but I do like watching the way the spidery flowers unfurl and mature, and how they catch the light in the window in lovely patterns of light and dark. I can't confirm the name 'Sarabor Lilac' online, but it is possible that it has mutated in the past few years: a number of the labels are inscribed 'Samobor Lilac', obviously in subconscious thought of the Geranium phaeum of that name! The first buds on Galanthus plicatus subsp. byantinus 'Three Ships' 'popped' overnight and the flowers are hanging down; it will probably be a few days before they have matured enough to open. It counts as being in flower, however, and this is about the earliest date I can recall 'Three Ships' being out. When it was found by John Morley in 1984 it was reliably Christmas-flowering, gaining its name from the well-known Christmas carol 'I saw three ships come sailing in.' Since then, however, and especially in the past decade, it has seemed to flower earlier and earlier, moving from early December into November. Whatever the cause, this makes it a particularly valuable late autumn plant; being vigorous and robust it quickly makes a large floriferous clump that is very welcome at this time of year. In July I wrote about a huge bulb of Galanthus elwesii 'Natalie Garton' that I'd lifted for propagation. At the same time I found a similarly sized bulb that had been hollowed out by the larva of the Large Narcissus Fly in the previous year, leaving only the shell of bulb scales behind. These were still alive and showing signs of making adventitious buds, so I popped the whole thing in a bag of just-moist vermiculite, as for twin-scales and left it for the summer. Potting up the season's twin-scales recently I found that this bulb had indeed been keen to propagate itself, producing a mass of bulbils from both the lower edge of the scale and its 'flanks'. The theory behind the practice of propagation by twin-scaling is that a bud develops in the axil of the scale fragment (a modified leaf) and the piece of basal plate (a modified stem) to which it is attached, in concordance with the principle that there is always a bud in the axil of a leaf and stem. In 90% of snowdrops this is what happens, but there are some cultivars in which adventitious buds develop on the surface of the scale as well, and in these it is immaterial whether there is any basal plate attached. 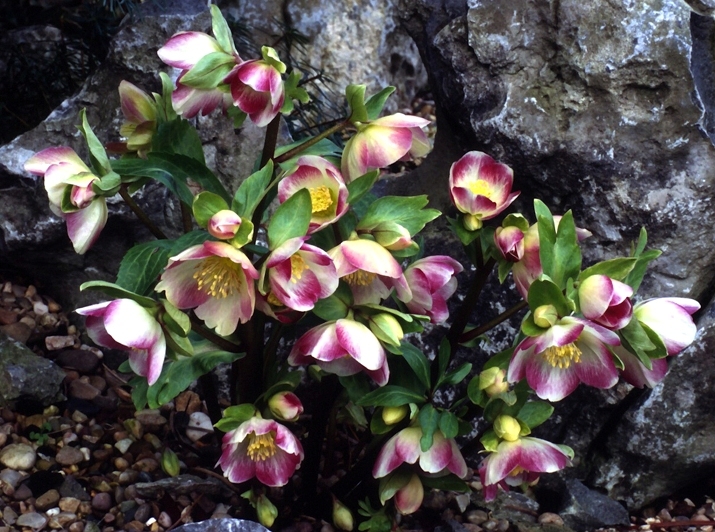 The phenomenon needs more careful study, but it is evident thsat when it works it is a useful survival strategy; from one bulb we will now have a couple of dozen to flower in two or three years' time. For once the Narcissus Fly has done us a favour! 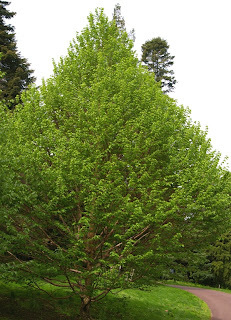 ﻿﻿﻿﻿﻿﻿﻿ A flying visit to the UK by my friend Jimi Blake of Hunting Brook Gardens in Ireland provided an excuse for a pleasant visit to the National Arboretum at Westonbirt this morning, enabling us to catch up as we walked round this great collection of trees. The famous spectacle of the autumn colours of the maples was long gone, but this meant that there was no distraction from the beauty of the trees in the mist, or the fine details of other plants. 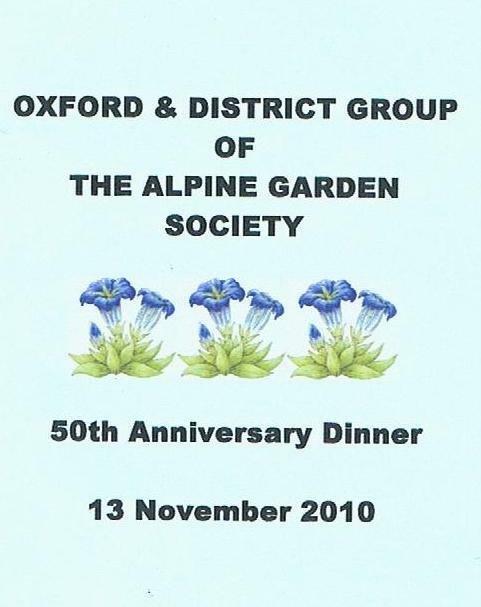 Last night the Oxford and District Group of the Alpine Garden Society celebrated its 50th Anniversary with a splendid dinner, held at St Margaret's Institute in Oxford. Val Lee, President of the AGS, Christine McGregor, the Society's Director, and Jim McGregor, its Webmaster, joined 40 members to hear Brian Mathew speak on his choice of 'Plant of the Month'. This was a model of what a talk should be; interesting, amusing and well-illustrated, and above all, brief and to the point. It is not surprising that Brian has been the Group's most popular speaker over the years, having addressed us six times since his first talk in 1964, on Daphnes. The Group was founded in October 1960, holding its first meeting the following month, when Roy Elliott gave a talk illustrated by colour slides, evidently a noteworthy point in those days. 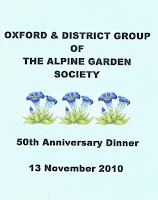 As Bryan Wardley, our current Chairman, reminded us last night, the group has had a number of eminent and well-known members over the year, including the late Valerie Finnis, Winton Harding, Maurice Rogers, Bill Baker, Primrose Warburg and Richard Nutt, and has played its part in the affairs of the main Society. While missing them and reminiscing about them, it was great to be able to celebrate the fiftieth anniversary yesterday in the company of so many current members and old friends. As a group we now meet for a talk six times a year between October and March, and arrange a programme of garden visits and social occasions during the spring and summer - posted here. We're always delighted to welcome new members and visitors, so if you would like to come to one of our meetings or events, please get in touch. This has nothing to do with horticulture - I just find it hilarious. Enjoy! The current issue of Arnoldia, the excellent magazine of the Arnold Arboretum, is devoted to celebrating the achievements of NACPEC - the North America-China Plant Exploration Consortium - over the past twenty years, and looks forward to its ambitions for the future. NACPEC was started in 1991 as loose confederation of American institutions with an interest in collecting new material of Chinese plants, and started off with a preliminary, mostly diplomatic visit to China that autumn. 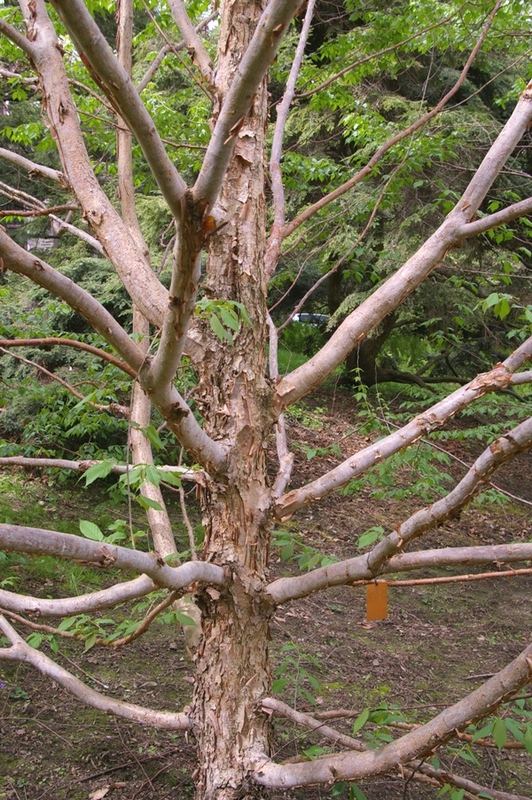 Twelve expeditions have now been completed, each bringing back valuable material that has strengthened the plant collections of many of North America's most important collections, including the US National, Arnold, Holden, Morris and Morton Arboretums, Longwood Gardens and the University of British Columbia Botanical Garden. NACPEC has also benefited Chinese institutions and botanists who have taken part in expeditions or received training in the United States. Reciprocation of plant material to Chinese gardens has also been possible, making this a very positive collaboration in every way. Printed copies of Arnoldia are provided to Members of the Arnold Arboretum, but the journal is very generously - and most usefully - made available online by Harvard University. 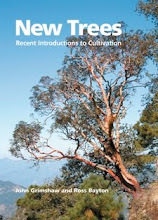 I heartily recommend it to anyone with an interest in the history of plant introductions, and congratulate the authors and expedition members on this important anniversary. The female Yews (Taxus baccata) here have had a huge crop of 'berries' this year; although they are quite reliable in producing a good crop this year's seems exceptional. What is generally called the berry is formed of a single seed that develops from the naked ovule characteristic of gymnosperms, produced on the twigs in about March. As it grows it becomes surrounded by a red fleshy aril, which develops from the disc on which the ovule is borne. The ovules are not usually noticed when receptive in early spring, unlike the male strobili or cones which are conspicuously pale and can release huge clouds of pollen in the right climatic conditions: the trees are either male or female, though occasional hermaphrodites are known. At lunchtime I came in from a morning potting-up bulbs, including corms of the gorgeous Sparaxis tricolor seen above, to find a copy of the new edition of Graham Duncan's Grow Bulbs waiting for me in the post. When I heard that he was publishing a new edition I had difficulty recalling the first - it is a slim little thing of only 64 pages, now spectacularly superseded by this new 390-pager, the biggest so far of the very useful Kirstenbosch Gardening Series published by the South African National Biodiversity Institute. 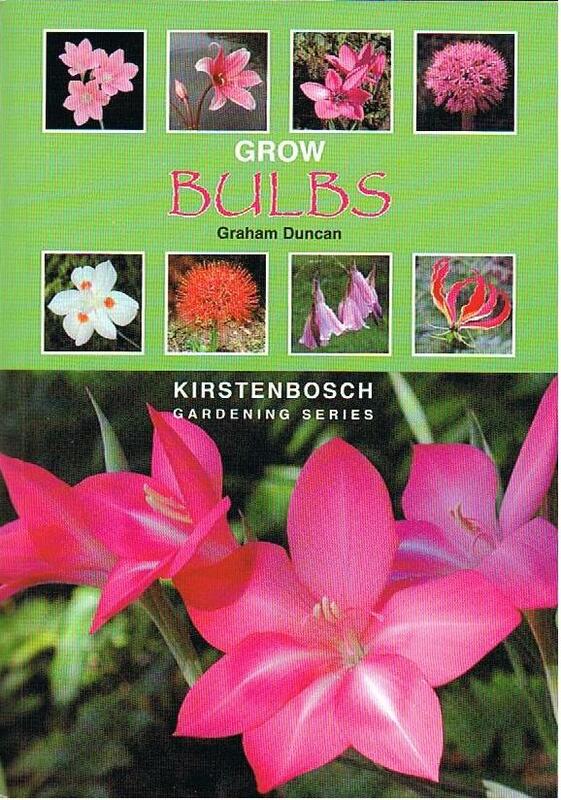 Graham Duncan has been 'Mr Bulbs' at Kirstenbosch for almost as long as anyone can remember - he has been working there since he was a very tender age - and this book distils his lifetime's experience growing many of South Africa's 2500 geophytes. It will undoubtedly be of huge assistance to anyone interested in growing such plants, though for those outside South Africa it should be noted that it is written for growers there, and suggestions will have to be adapted for our growing conditions. The biggest problem, I find, in growing the winter-growing South African bulbs here is the low light intensity of the British winter: even in what Capetonians call winter, when they are bundled up in longjohns and the like, they enjoy a far closer relationship with the sun than we do in the corresponding months. At least we don't have to contend with pests such as porcupines that can be devastating to bulbous plants in the Cape. ﻿ Graham has a clear writing style and his text is very accessible: this is a book for gardeners, not botanists (although I'm sure many will consult it for its breadth of information and abundant illustrations), so technical terms are kept to a minimum. Cultural conditions are usually well described, but a series of summary symbols is also provided for most entries. The usually excellent pictures were almost all taken by Graham, but as with some other books in this series, the reproduction is unfortunately not always as good as it might be. However, since the book covers plants from the whole of southern Africa, a far wider range of species is illustrated than is usually the case on works focusing on the flora of the Western Cape, and horticulturally interesting variants are often shown. Within the genera it makes no attempt to be comprehensive, covering only a selection sufficient to show the diversity of each genus - 10 from 100 Western Cape Romulea, for example, and with great restraint, 19 of 120 Lachenalia species. For this, Graham's favourite genus, his completed full revision is just around the corner. In the meantime, I'm sure Grow Bulbs will both inspire and assist many in their attempts to grow South African bulbs. "After 14 years of Rocky Mountain Rare Plants, we are moving on to other interests and passions. This is the last seed catalog we plan to offer as we will be shutting down our business. In our final offering, we have over 180 items. Seed was collected in many locations including the Rocky Mountains of Colorado, Wyoming, Utah and the high deserts of the American West, along with a few items from the Alps. Our website, http://www.rmrp.com/ has information on how to download our catalog." A quick scan of the catalogue shows that there are indeed some superb choice plants there: Mertensia cana, Lloydia serotina and a selection of Castilleja and Pedicularis spring to attention. One wonders when some will be commercially available again. RMRP will accept its last orders on 26 December 2010. I took advantage of the more or less fine weather today to get our 'long meadow' mown for the last time today. This is the area of lawn allowed to grow long through the spring and summer, in which bulbs and perennials are encouraged to do their own thing - as opposed to the short meadow, the other half of the lawn, planted with crocuses and cowslips only for an early show, but then returned to short turf for summer lounging. The long meadow gives as much pleasure as any other part of the garden, changing through the season as the first snowdrops and crocuses give way to daffodils, fritillaries and cowslips: the bulb foliage disappears as the grass grows up and the larger perennials take over the show amid masses of yellow rattle, culminating in the display of Iris latifolia in late June, but flowers continue into August, making it hard to decide when to mow. The area is mown a couple of times in mid-August and then left for the colchicums and autumn crocuses to come up and flower. Once they are finished it is safe to give one final cut to remove the autumn's regrowth, leaving the turf short for the early bulbs to emerge through. It's a simple enough regime for so much colour, interest, and pleasure. ﻿It seems to be generally agreed that the autumn colours in England are exceptional this year, with unexpected species turning to unexpected colours. The change came swiftly, and the effect will not last long: certainly last night's strong winds took many leaves off the trees here, and it is blowing again now. Here are a few views and specimens at Colesbourne Park from the past week or so. Sycamore, Acer pseudoplatanus - very seldom seen in good colour like this.